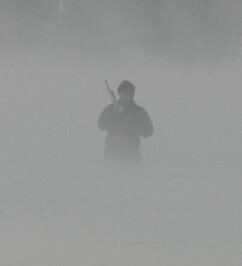 Captain Nick Steen started hunting waterfowl at an early age. Through experience, hard work and determination he has developed the skills and resources necessary to be successful in this endeavor. 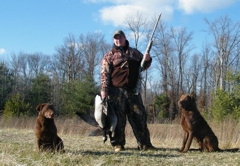 Captain Nick has been actively involved in the waterfowling community through several conservation organizations including Ducks Unlimited, Delta Waterfowl and the Maryland Waterfowlers Association. He has also served as Representative of Harford County for the MDWFA. Captain Nick also serves as a EMT/Fire Fighter for Baltimore City. If you have any questions or concerns please feel free to contact us with the information found in the Contacts page by following the appropriate link provided in the menu areas. Steen Outfitters & Kennel is committed to providing an exceptional hunting experience to our clients. The Chesapeake Bay provides some of the most versatile and exciting waterfowl hunting opportunities available on the East Coast. Through our years of experience and top quality resources we strive to make each and every hunt a memory that will last a lifetime. For information on puppy availability check the News/Puppies Section. We were on the American Gun Dog TV Show !